Parm Gill, M.P., congratulates Fauja Singh in the House of Commons Parm Gill, Member of Parliament for Brampton-Springdale asked the House of Commons to come together to congratulate Fauja Singh on his world record breaking success. This past weekend at the Toronto Waterfront Marathon Fauja Singh, at 100-years of age, achieved his life-long dream. He became the oldest person and the first centenarian to ever finish a full marathon. To further add to his success, Mr. Singh broke world recorders for runners older than 100 in the 100m, 200m, 400m, 800m, 1500m, 3000, and the 5000m distances. 2011: Mr. Gill was first elected to the House of Commons during the 2011 federal election where he ran against the Liberal incumbent. In 2006 he began his candidacy in Brampton-Springdale. He has been involved in politics for many years with the desire to make a change in Canada. Born in India, Parm Gill was raised and educated in Toronto from the age of 14, when he immigrated with his family to Canada. Resides in Brampton with his wife Amarpal, his two sons, Raman and Daman, and his daughter Parmeet. Parm has been heavily involved in Brampton-Springdale through organizations such as the Peel Regional Police, Malaysian-Singapore Cultural Association and Canadian Eye Sight International. 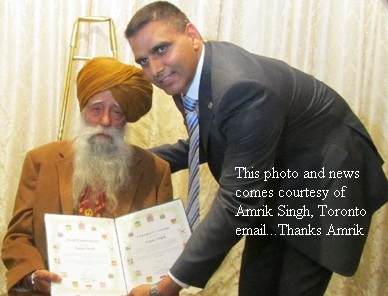 Parm has made significant contributions to Brampton through round-tables with our seniors, veterans, immigrants and business owners. Parm is excited and eager to begin serving his constituents as a member of the Government of Canada, under Prime Minister Stephen Harper. An OSSD Graduate, with a Diploma in Private Investigation, Parmworked as a senior vice-president of Paramount Manufacturing.